WASHINGTON, D.C., March 27, 2018 — Thousands of miles of fiber-optic cables crisscross the globe and package everything from financial data to cat videos into light. But when the signal arrives at your local data center, it runs into a silicon bottleneck. Instead of light, computers run on electrons moving through silicon-based chips — which, despite huge advances, are still less efficient than photonics. To break through this bottleneck, researchers are trying to integrate photonics into silicon devices. They've been developing lasers — a crucial component of photonic circuits — that work seamlessly on silicon. 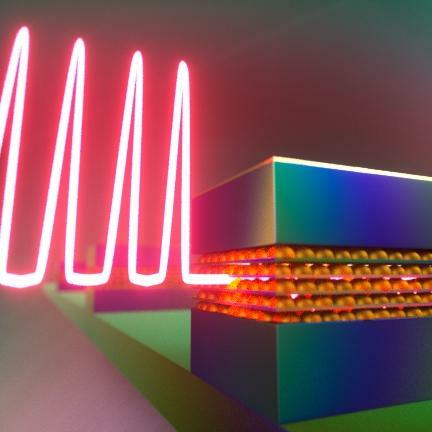 In a paper appearing this week in APL Photonics, from AIP Publishing, researchers from the University of California, Santa Barbara write that the future of silicon-based lasers may be in tiny, atomlike structures called quantum dots. Such lasers could save a lot of energy. Replacing the electronic components that connect devices with photonic components could cut energy use by 20 to 75 percent, Justin Norman, a graduate student at UC Santa Barbara, said. "It's a substantial cut to global energy consumption just by having a way to integrate lasers and photonic circuits with silicon." Silicon, however, does not have the right properties for lasers. Researchers have instead turned to a class of materials from Groups III and V of the periodic table because these materials can be integrated with silicon. Initially, the researchers struggled to find a functional integration method, but ultimately ended up using quantum dots because they can be grown directly on silicon, Norman said. Quantum dots are semiconductor particles only a few nanometers wide — small enough that they behave like individual atoms. When driven with electrical current, electrons and positively charged holes become confined in the dots and recombine to emit light — a property that can be exploited to make lasers. The researchers made their III-V quantum-dot lasers using a technique called molecular beam epitaxy. They deposit the III-V material onto the silicon substrate, and its atoms self-assemble into a crystalline structure. But the crystal structure of silicon differs from III-V materials, leading to defects that allow electrons and holes to escape, degrading performance. Fortunately, because quantum dots are packed together at high densities — more than 50 billion dots per square centimeter — they capture electrons and holes before the particles are lost. These lasers have many other advantages, Norman said. For example, quantum dots are more stable in photonic circuits because they have localized atomlike energy states. They can also run on less power because they don't need as much electric current. Moreover, they can operate at higher temperatures and be scaled down to smaller sizes. In just the last year, researchers have made considerable progress thanks to advances in material growth, Norman said. Now, the lasers operate at 35 degrees Celsius without much degradation and the researchers report that the lifetime could be up to 10 million hours. They are now testing lasers that can operate at 60 to 80 degrees Celsius, the more typical temperature range of a data center or supercomputer. They're also working on designing epitaxial waveguides and other photonic components, Norman said. "Suddenly," he said, "we've made so much progress that things are looking a little more near term." The article, "Perspective: The future of quantum dot photonic integrated circuits," is authored by Justin C. Norman, Daehwan Jung, Yating Wan and John E. Bowers. The article will appear in the journal APL Photonics March 27, 2018 (DOI: 10.1063/1.5021345). After that date, it can be accessed at http://aip.scitation.org/doi/full/10.1063/1.5021345. APL Photonics is the dedicated home for open access multidisciplinary research from and for the photonics community. The journal publishes fundamental and applied results that significantly advance the knowledge in photonics across physics, chemistry, biology and materials science. See http://scitation.aip.org/content/aip/journal/app.